Today we showcase an exciting and a successful venture co-founded in 2008 by Ian McCallam from Sydney, NSW, Australia, SMS Poll - Mobile Text Message Voting Application. Born, raised and graduated in London. I now live in Sydney. I’ve always been a bit of an ‘inventor of ideas’ and when the Internet came along I knew I could put down my pencil and paper and start creating things in a new world where they would be seen by people across the world (rather than just my friends and next door neighbor!). 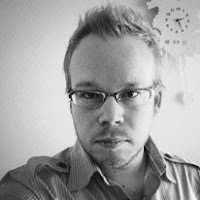 I started my digital media career about 10 years ago at a London agency creating online solutions for a variety of blue chip clients. I spent my spare time writing about emerging trends on the web and across the world as one of the founding writers for PSFK.com. I later went on to establish a music agency for three years and then moved to Sydney in 2004 to launch and manage the Australian office for a British entertainment company specialising in DRM. 2 years later after rolling out the digital sales channel for one of Australia’s largest music retailers, I went on to develop three online products in the Asian mobile arena. Feeling the need to work on what I could class as my own project again and to have a taste of the Australian start up industry, I met up with Anil Sabharwal and soon we co-created RAYV and now we have launched SMS Poll. SMS Poll is a sophisticated yet simple text message voting application that lets you poll your live audience to quickly and easily gather in-moment data and find out what they are really thinking. It’s requires no special hardware or software and is a tenth of the price than traditional Audience Response Systems. It also eliminates some of the standard traits of ARS such as the requirement to pay for expensive technicians, pass out clickers and configuration of voting software. SMS Poll works by allowing a poll organiser to quickly create, customise, and share his/her poll in PowerPoint or online. The audience votes by sending an SMS to a local phone number or by browsing to a mobile friendly webpage, and the results for the poll update in real-time, right before the audience’s eyes – using one of SMS Poll’s .swf charts. The poll organiser can then download the results for the poll into Excel for further analysis. We launched in July 2008 and we are currently available in Australia and the UK. We have plans to extend the service across a variety of other major countries in the coming months. There’s Anil Sabharwal who is the Managing Director and I head up the Marketing and Product Development. We also have Philip McCauley who is our Head of Finance. Clifford Rosenberg (Former MD of Yahoo! Aus & NZ. Founder of iTouch Australia) has recently joined us as an advisory board member. SMS Poll actually came to fruition through a personal need. Anil and I run another Aussie start up called RAYV. A local UGC business review site. We were holding a fairly large awards night for the end of our marketing campaign and we wanted to let attendees vote on their favourite business review. And more so, we wanted them to be able to view the results (real-time) as they were received. We just couldn’t find a suitable service in Australia that matched our needs. So, we decided to build it. With a bit more research into the market this looked like a great business opportunity and an innovative new tool for not only event planners, but also teachers, students, NFPs, market researchers or any other type of live audience organiser or participant. We’re both idea geeks and this was another project / idea that really interested us once we saw the greater business potential. And so SMS Poll was born. We just couldn't find a suitable service in Australia that matched our needs. There was (and still is) a brilliant service in the US by the name of Poll Everywhere, but it wasn't available here. We really liked what they were doing and decided to build a similar offering down under. It started off as more of a pet project to meet a single requirement, but immediately we got interest from other people who wanted to use it. So we scaled it up some more and decided to make it available to event planners, teachers, students, NFPs, market researchers or any other type of live audience organiser or participant. We're both idea geeks and this was another project / idea that really interested us once we saw the greater business potential. And so SMS Poll was born. We launched (Beta) in July 2008. It took us approximately 3 months to get our core offering to market. For SMS Poll to be recognised as the number one tool for cost effective, innovative and fun audience polling, providing the ability for a variety of people to gauge their audience’s opinions and reactions within a matter of seconds. 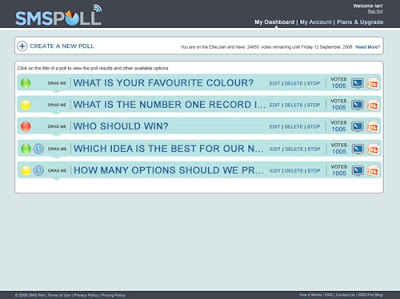 Poll creators can quickly and easily build a poll and present it live to their audience in four simple steps. 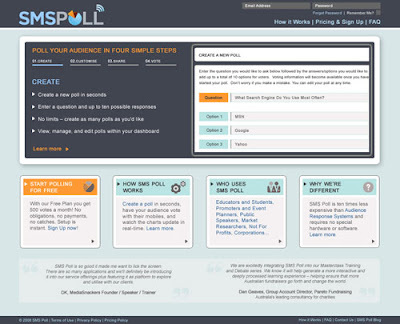 Poll creators can choose from a variety of features such as different styles of charts and effects, Auto Stop (handy if you need to stop your poll at a specific date/time), Web voting, Results Requests (have your results sent to your mobile), Embed to PPT, Embed to Blogs and SNS, Results analysis and export results to Excel. Participants can easily engage with polls by either sending an SMS to a local number, web voting or mobile browser voting. A variety of new features are currently in development and eventually we’ll see SMS Poll grow as a tailored offering with specific tools targeted to each of our core markets. Educators & Students, Promoters and Event Planners, Public Speakers, Market Researchers, Not For Profits, Corporations and anyone else looking to work with an audience and wishing to gain their insight. We currently have over 350 active users. We’re still very young, but growing fast. • What sort of marketing are you are using to spread the word? With our current offering we’re first and foremost adopting a viral approach making use of the usual suspects such as blogs, Facebook, StumbleUpon, Twitter etc. We use these channels to spread the ‘newness’ of the product. We are and will continue to spend a great deal of time talking and meeting with the people who are our future consumers and who we also consider as the potential influencers. SMS Poll is very much a product that will be seen and used in offline social network environments, so it’s here that we will probably be spending most of our time demo’ing and educating people about the product. Coupled with our viral methods we also adopt SEM such as Google AdWords and SEO to help direct other consumers to our site. Once our new product features are live then we will be looking at a dedicated marketing campaign across Australia and the UK and any other countries we may be operating in at that time. We’re strong believers in a quality product and quality customer service to back it up. We grow with customer feedback. And we believe this is key to providing a successful product/service for your market. Currently SMS Poll offers a 6 tier pricing structure. We have a fairly generous free plan for individuals, students and small businesses looking to poll an audience of no more than 25 people. We also offer custom plans and solutions (outside of our current product offering) and one-off pricing for large scale projects. These are tailored to the client’s needs and the environment in which the product will be used. I expect eventually we will see structured pricing models split across the various markets we target as well as enterprise licensing. We are using a few open source components / libraries, but the majority of work is new development. A tasty sandwich of fun‘n games wrapped around a healthy portion of little sleep and a slice of stress. Being an entrepreneur is definitely exciting times especially when you can see people actively using your product and providing you with positive feedback. But as glorious as it sounds, it also depends on your outlook and what you want from a job/life. If you’re after the 9-5, big bonuses, office perks (and, maybe even an office?!) you might want to take the other direction. Being an entrepreneur comes with its pros and cons and potentially more of the latter, but if you’re willing to put in the graft and realise that overnight success doesn’t come to everyone then hopefully the pros will soon outweigh the cons. Starting a venture in Australia (as opposed to your popular international hot beds like Silicon Valley) certainly adds a few preliminary ticks to the ‘cons’ column, but I think anyone will tell you that these days. However, the market is growing, it’s slowly getting stronger and a few more risks are being taken. Resources and networks are becoming more widely available by the active influencers and participators of the market, but right now I believe being an entrepreneur in Australia is all about putting the risk on your own shoulder and building on your own investment with a hope for VC support once your startup begins to show signs of success. The level of innovation is on the increase with more and more new, fresh ideas being developed. We’re definitely in exciting times. However, these ideas need to be more widely publicised to the rest of the world – so other countries are aware of what we’re producing. The culture is getting stronger and it’s the individuals participating in this market coupled with dedicated events and organisations such as the Top 100 Australian Web Apps, Anthill Cool Company Awards, Pitch Australia, Small Business Month, the ASSOB etc that are paving the way for this to happen. • How do you see the mobile battle between iphone, google (android) & rest of the players? It’s an exciting discussion. It was only time before Google entered the arena. I don’t own an iPhone (gasp) but I’ve been holding out. I’m not an iPod fan either (double gasp!) – so this is already a wasted feature for me on the iPhone. Personally I’ve been playing the battle between the iPhone and the HTC Diamond Touch. The iPhone is definitely a shining star but I don’t think it’ll be too long before there’s a variety of ’just as good’ options out there. Of course, there’s the majority factor that the iPhone falls in the Apple suite of products, so to many – it will never be beaten. And this is one of the major factors that will play the battle between the iPhone and Android. At the end of the day for the majority folk it’s brand awareness. Let’s face it. You can’t really consider there to be a battle at the moment when to most, the iPhone is hardware and the Android is software. It’s really down to the hardware manufacturers incorporating Android that will create the true battle between the two. We all know that iPhones look cool. Interestingly it’s HTC who seem likely to launch the first Android phone – the Dream. So immediately the comparisons will begin not only on capabilities but also what is the most visually appealing. If a great looking Android phone was released and Apple kept the same aesthetic design but bumped up the capabilities to match those of the Android, I’d bet iPhone would still outsell. However, there is a consideration from a development point of view and from what I’ve heard, the ease of programming on the Android SDK compared to the iPhone is much less complicated. What will result are increased offerings at lower cost and with a quicker time to market. How will this leave the iPhone user feeling? Maybe like they are missing out on the latest and greatest features, but then again only time will tell. Who knows what Apple has up their sleeve as a counter play? I for one will be holding out to see the first Android phone and what it really brings to the debate. As often as possible and more so now with SMS Poll. If it’s not in person (sometimes there just isn’t enough time in the day!) then it’s regular introductions and communication via online. There’s always new startup ‘meet ups’ being organised in Sydney and we generally aim to get to as many of these as possible. If you can build it for a dollar and sell it for two. Do it. Start today.It’s fun and frantic. Whatever happens, you’ll experience a steeper learning curve in a shorter period of time that you might not get by doing your day to day job. Get your plan together, keep focussed and deliver your core offering. The rest can come later. You have to learn to split features across phases. We all want the best product with every feature from day 1. But you have to be realistic. Get it to market and build in the background. Don’t be afraid to discuss your idea. Talk to as many people as possible. Build your network. There’s a fear of sharing new ideas, but I always believe the more ideas and thoughts you share, the more you get back. Thanks Ian for sharing your thoughts with us. All the best for future. These Aussies are a pretty pathetic example of "innovation"... between SMSPoll.net copying Poll Everywhere (verbatim in a lot of their marketing) and Vishia copying Livingston's "Founders at Work" book concept as his Twitter stream background... its just... pathetic. Come on guys, you do know that Google crawls Australian web pages, right!? Stop being delusional, turn off your copy machines, and innovate! Ridiculous!! Your main competition is not IML or eInstruction, your main competition is the site you copied everything from (including the idea to position yourself against IML and eInstruction!!! ): http://www.polleverywhere.com. Christ, what a rip-off. SMS Poll has never denied that we got our inspiration from Poll Everywhere, and this was an omission in the interview that we're trying to get rectified. We've got nothing but respect for the Poll Everywhere team, and in fact send them a number of leads every week from people in the US who contact us. I'd like to see Polleverywhere verify you're sending them leads. Come on, who sends leads to an eventual competitor? Also, why did this hack rip off Founders At Work? Is this parody? What's your sequel book going to be called - Entrepreneurs Working Diligently? Hi Damon, thanks for yr comments mate. "The Founders at Work" is just and idea in exploration. Its will not be this name & design if i finally decide to publish it. Damon - this is Jeff from Poll Everywhere. I can confirm that SMS Poll sent us some US-based leads (we sent an AU based lead back to them as well). We still hope they choose to differentiate their product and marketing. This is Brad from Poll Everywhere -- Just to clarify a point in this article; Poll Everywhere has been available in Australia for some time. To use Poll Everywhere in Australia you can select "Australia" as your service area when you sign up or change your service area in your profile. This is a shameless copy of an existing idea. From what I hear there is nothing new in this approach from the Aussie boys at SMS Poll. Poll Everywhere should seriously look at its Australian operations if it thinks SMS Poll is being completely honest.